A conga line broke out on the basepaths at Target Field last night. The Twins’ pitching staff gave up eight run on 10 hits and six walks, yet they still won by seven runs. The offensive outburst was led by Logan Forsythe, who was a perfect 5-for-5. 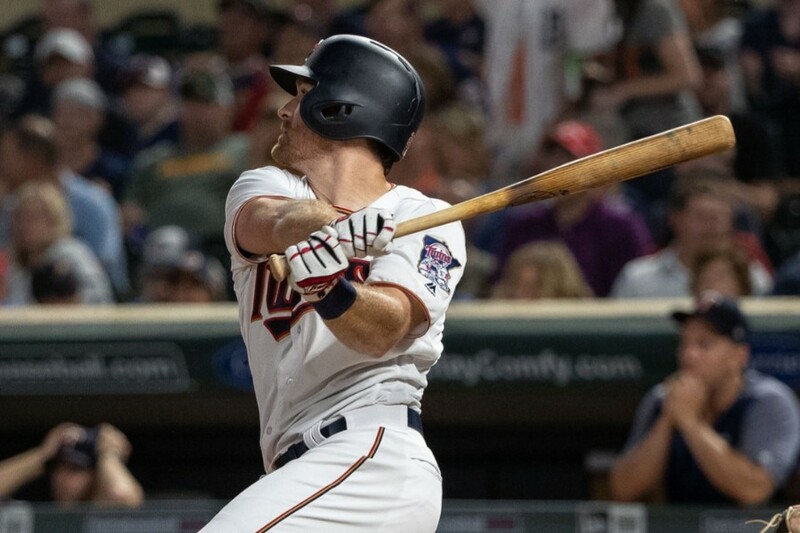 After tonight’s hit parade, Forsythe is now 22-for-49 since joining the Twins, posting a .449/.500/.531 batting line. He only had 40 hits in 198 at bats with the Dodgers this season. The Twins have struggled to score runs in bunches this season, but they managed to rack up 15 runs despite only scoring in three separate innings. 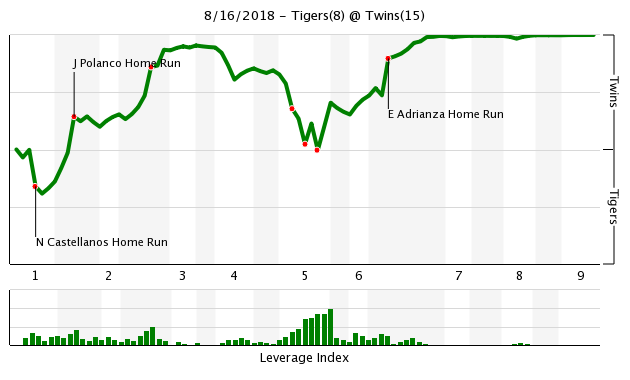 Jorge Polanco hit a three-run homer in the first inning, the five-run second inning was highlighted by a Miguel Sano two-run homer and they managed to tally seven runs in the sixth thanks in part to an Ehire Adrianza two-run blast. This was Ervin Santana’s fifth start of the season. He now has an 8.03 ERA. Not sure how a team out of contention could possibly justify continually trotting out a struggling 35-year-old on an expiring contract (there’s no way they’re picking up his $14 million option). Santana loaded the bases without recording an out in the fifth inning. Trevor May took over and walked in two inherited runners, bringing Detroit back within a run of the Twins. May also pitched a scoreless sixth inning. Addison Reed gave up a run over his two innings of work and Oliver Drake delivered a clean ninth inning. Ervin is cooked, time to see some youth. I went to bed before the game ended. Good to see they got that insurance run I was hoping for. It's a thirteen million dollar decision this off-season. I have no objection if they perform some additional due diligence in the meantime, by giving him more starts. Okay, so my new fantasy is that the Twins finish .500.
run out of towels to throw in. His velocity is down, his command of the strike zone is almost non-existent right now. I'd say that the thirteen million dollar decision has already been made. I agree that The Twins owe it to themselves (and Santana) to continue to roll him out there. Gibby had a run of bad starts last year and he got better, you don't just throw away next year's possible #3 or #4 starter because he's bombing in what basically amounts to Spring Training. Let me try to say it slightly differently: If I were GM, I can make shoot-from-the-hip determinations about players like Tyler Duffey or Nick Gordon (as I do), and it doesn't matter, financially or otherwise, because those decisions can be revisited next year at zero incremental cost. Ditto, if I don't learn everything there is possible to know about upcoming starters like Romero and Gonsalves. But if I'm aiming for contention next year, and I have a multi-million dollar asset that I have to make a binding decision about in a couple of months, then the standard for good stewardship of the franchise is a lot higher. Turning thumbs down on Erv so early, and then having him contribute positively to some other team's pennant push in 2019, would be a pretty bad stain. You can't go out and obtain a good asset at $13M with the snap of the fingers. I don't blame the front office if they put the decision off as long as possible. To shut Erv down now would be that decision, while foregoing additional information that could be gathered. You never know, it's only been a few starts and he's coming off an injury. The Twins can bring Gonsalves up Sept 1 and go with a six man rotation down the stretch (or skip starts for each starter once to give them a break). If Santana had two or three good starts now (seems unlikely but could happen) you might still trade him. If he's still this bad, then you might have to think pen. Did you watch the game?He pitched terribly.He's lucky he got through 4 innings throwing that garbage.88mph belt high fastballs shouldn't get anybody out.He kept throwing one after another.He has Bartolo Colon type velocity with terrible command.It sends a bad message to the team to trot him out there again.He has nothing left in the tank. Molly should have taken Santana out earlier.Try to win games not give the runs back with a big lead.4 Tigres runs and I go get him. I'm not suggesting that we try and tank for the remainder of the season, but that would be preferable than trying to reach the .500 level. I mean, the worse we finish the better chance we'll have in the June draft, right? I think that matters more at this point. Every game matters to me. No way do I want any player or coach on the team not giving everything to win everyday. Playing to win matters. It matters to those watching the game. It matters to the development of players. It matters way more than a handful of spots in a draft. I don't think anyone wants the players to pack it in, it's just if they lose it's a good thing. We, or at least me, still want the players to try. If they try and fail, it helps in the draft which is very fine by me. We haven't shown the ability to take advantage of high draft spot. I'd agree if this were football.The MLB draft is such a crapshoot, I don't care much about being a couple spots higher.I'd rather try developing a winning attitude on the field. What To Do With Logan Forsythe?